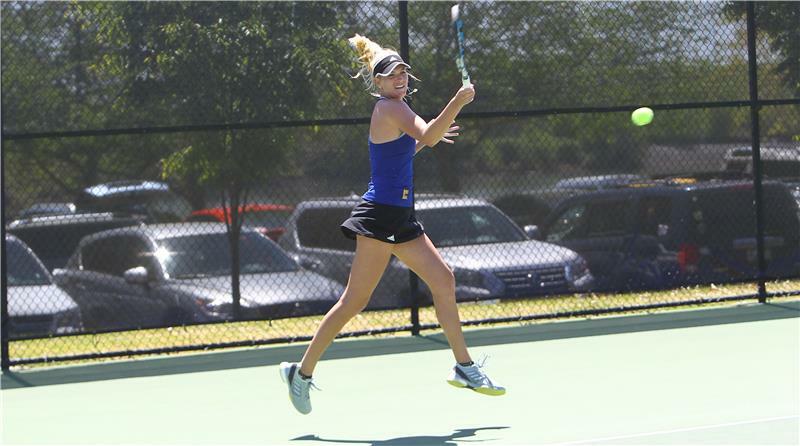 The University of Tennessee at Chattanooga women’s tennis team pulled out a 4-0 win over Mercer in the opening round of the Southern Conference Tournament at the Champions Club in Chattanooga today. The Mocs move on to face top-seeded Furman in tomorrow’s semifinals. “That was a battle,” stated head coach Chad Camper. UTC won the opening doubles point with wins at No. 1 and No. 2. Mercer took the No. 3 doubles match to open the dual. Junior Caroline Hall and freshman Bogdana Zaporozhets posted a 6-2 win at No. 2 to even the doubles. Trailing 4-3 at No. 1, freshman Emma Van Hee and senior Samantha Caswell broke Grace Korta’s serve to tie the match at 4-4. UTC held serve to go up 5-4, then broke Katie Sidor for the 6-4 win claiming the doubles point. “I thought Bogdana and Caroline did a great job at No. 2 doubles, and Samantha and Emma just keep leading the team at No. 1,” continued Camper. Needing only three singles wins to clinch the team victory, the Mocs jumped ahead with first-set victories at No. 3, No. 5 and No. 6. Junior Delaney Edwards snapped a five-match slide with her 6-2, 6-4 triumph at No. 3. Van Hee won her fourth in a row 6-1, 6-4 at No. 5, while Zaporozhets clinched the match with her fifth straight win at No. 6 (6-3, 6-4). The win moves the Mocs to 10-7 overall. It is the ninth year in a row UTC has finished with at least 10 wins. First serve for tomorrow’s semifinal match against Furman is set for 2:00 p.m. (E.D.T.) at the Champions Club. A link for live scoring is available on the women’s tennis schedule page on GoMocs.com.